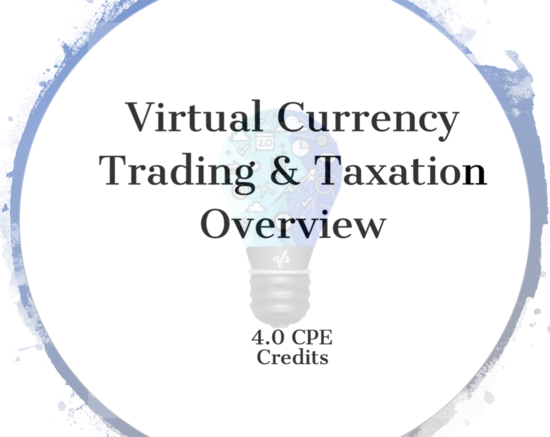 An overview of virtual currency, trading, taxation, and transaction accounting along with Internal Revenue Service reporting requirements. This course intends to get the audience familiar with the history and properties of Virtual Currencies as well as blockchain, the technology behind it. By the end of the course, you’ll be able to distinguish the difference between taxable and nontaxable events and increase your awareness of the trading and tax implications associated with digital assets. This course is 4 hours. This webinar will run on January 31, 2019, from 9:00 a.m. to 1:00 p.m. EST. Once purchased you will be sent a registration link via email to confirm your attendance. 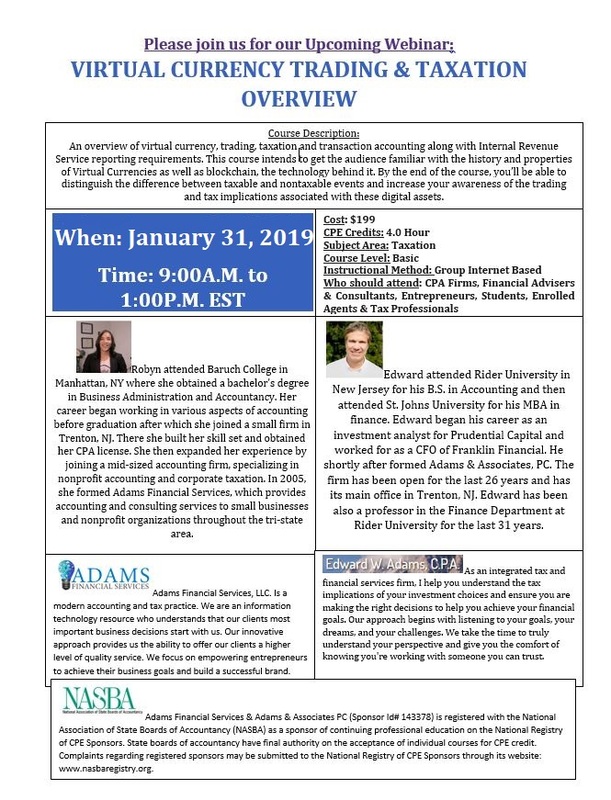 NOTE: Adams Financial Services & Adams & Associates PC (Sponsor Id# 143378) is registered with the National Association of State Boards of Accountancy (NASBA) as a sponsor of continuing professional education on the National Registry of CPE Sponsors. State boards of accountancy have final authority on the acceptance of individual courses for CPE credit. Complaints regarding registered sponsors may be submitted to the National Registry of CPE Sponsors through its website: www.nasbaregistry.org. 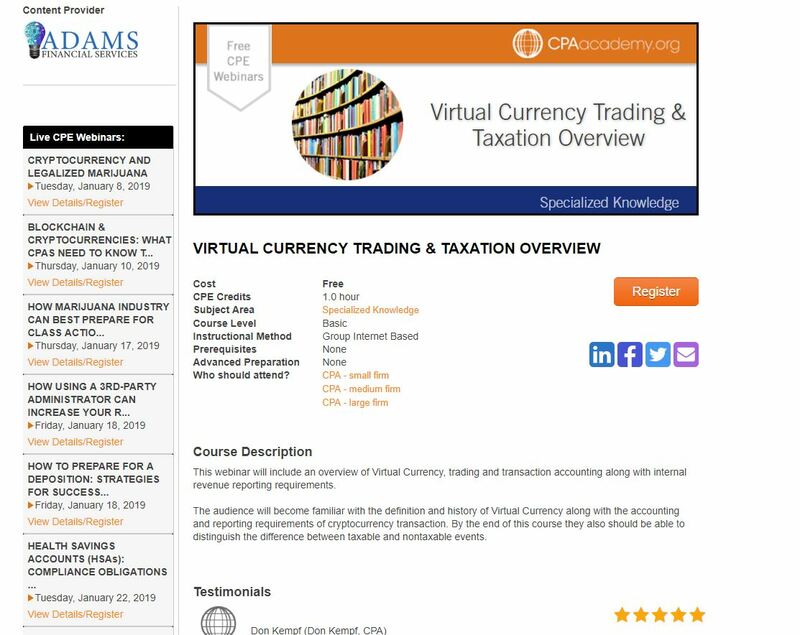 An overview of virtual currency, trading, taxation, and transaction accounting along with Internal Revenue Service reporting requirements. This course intends to get the audience familiar with the history and properties of Virtual Currencies as well as blockchain, the technology behind it. By the end of the course, you’ll be able to distinguish the difference between taxable and nontaxable events and increase your awareness of the trading and tax implications associated with these digital assets. This course is 2 hours. This webinar will run on January 31, 2019, from 1:00 P.M. to 3:00 P.M. EST. Once purchased you will be sent a registration link via email to confirm your attendance. 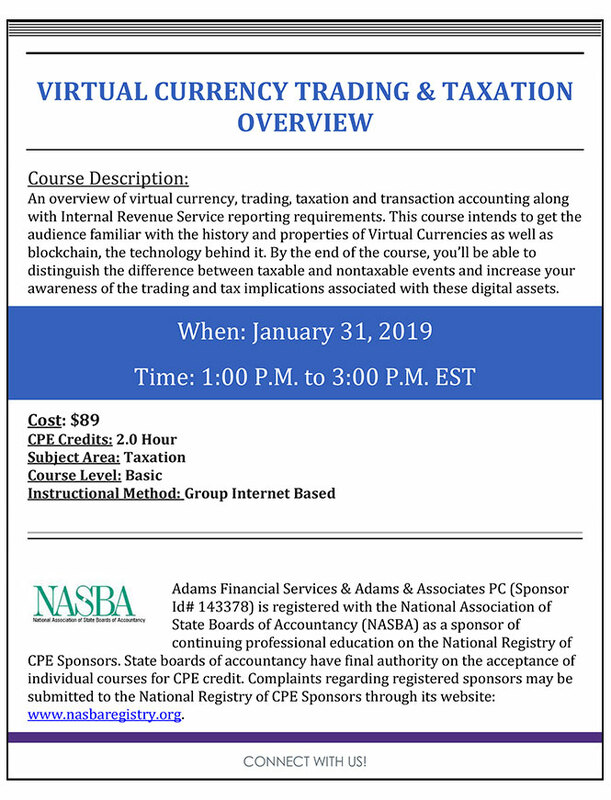 NOTE: Adams Financial Services & Adams & Associates PC (Sponsor Id# 143378) is registered with the National Association of State Boards of Accountancy (NASBA) as a sponsor of continuing professional education on the National Registry of CPE Sponsors. State boards of accountancy have final authority on the acceptance of individual courses for CPE credit. Complaints regarding registered sponsors may be submitted to the National Registry of CPE Sponsors through its website.